The Mercury Bay Museum is located in the old dairy factory across from the Wharf (11A The Esplanade, Whitianga 3510). Its hours are 10:00AM through 4:00M every day (except Christmas; phone them directly at 866-0730 for questions). 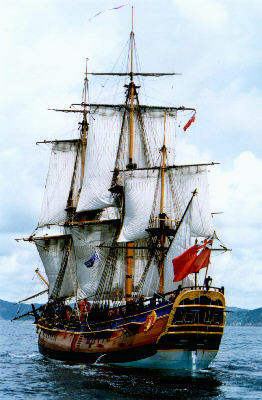 A 1990s replica sailing into Mercury Bay. © Barbara Pearson -- used by permission. "Captain Cook Sailed into History"
"Under the orders of his country, Cook, with his crew and fellow travellers, found himself sailing up the coast of a strange new land in the southern Pacific ... on Friday morning the 3rd of November" of 1769. 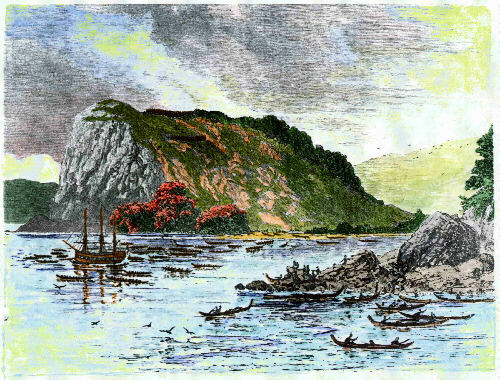 The actual site in the picture is Maramaratotara Bay, commonly known today as Flaxmill Bay.
" Toi-awa informed them that they were often visited by raiding parties from the north and south, who stripped them of all that they could lay their hands on, and at times made captives of their wives and children, and that, being ignorant who the English were after their first arrival, the natives had been much alarmed, but were now satisfied of their good intentions. With his help successful trading was carried out ..." (9) and Cook and Banks made their astronomical observations of the Transit of Mercury -- hence Mercury Bay. (1) Used by permission of Janet Riddle, bold-italic quote from Beaglehole, pp. cclxxxii, cclxxxiii, by special permission of the Hakluyt Society ©. (2) Used by permission of Janet Riddle, bold-italic quote from "Sir Joseph Banks in New Zealand," edited by WP Morrell, p.68. (3) Used by permission of Janet Riddle, bold-italic quote from "Cook's Journals," Beaglehole, p. 192, by special permission of the Hakluyt Society ©. (4) Used by permission of Janet Riddle, bold-italic quote from "Cook's Journals," Beaglehole, p. 193, by special permission of the Hakluyt Society ©. (5) Used by permission of Janet Riddle, bold-italic quote from "Cook's Journals," Beaglehole, p. 193, by special permission of the Hakluyt Society ©. (6) Used by permission of Janet Riddle, bold-italic quote from "Sir Joseph Banks in New Zealand," edited by WP Morrell, p.69. (7) Used by permission of Janet Riddle, bold-italic quote from "Cook's Journals," Beaglehole, p. 193, by special permission of the Hakluyt Society ©. (8) Used by permission of Janet Riddle, bold-italic quote from "Sir Joseph Banks in New Zealand," edited by WP Morrell, p.70.